Turkey 'doesn't want Dutch ambassador' to return after Holland refuses entry to Turkish FM, closes of consulate. Turkey on Saturday announced it "does not want" the Dutch ambassador to return to his post in Turkey. "We do not want the Dutch ambassador, currently on leave, to return to his post for some time. It has been explained to our counterparts that this grave decision taken against Turkey and the Dutch-Turkish community will cause serious problems diplomatically, politically, economically and in other areas," Turkey's foreign ministry said in a statement, adding that there were "security issues" involved as well. 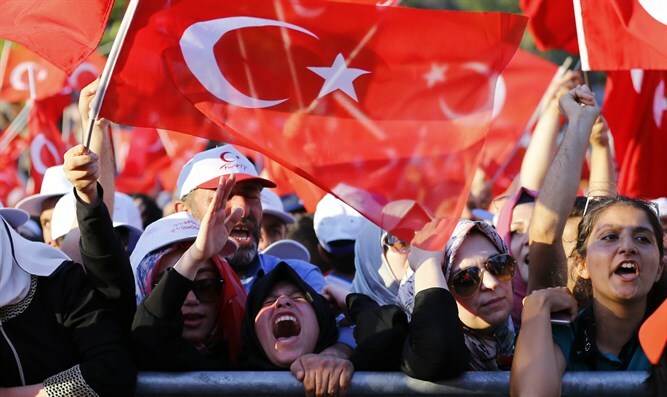 As part of the move, Turkish authorities blocked the Dutch embassy and consulate and closed off the residences of the Dutch ambassador, consul genera, and charge d'affaires. Turkish President Recep Tayyip Erdogan also accused the Dutch government of being "Nazi remnants" and "fascists." "You can stop our foreign minister's plane all you want, let's see how your planes will come to Turkey from now on," Erdogan said on Saturday at an Istanbul rally. "They are Nazi remnants, they are fascists," Erdogan said. Turkey's announcement follows Dutch refusal to allow Turkish Foreign Minister Mevlut Cavusoglu to land in Holland and Turkish Family Affairs Minister Fatma Betul Sayan Kaya to reach the consulate. On Saturday, the Dutch government refused to allow the plane carrying Cavusoglu to land in Holland because of "risks to public order and security." Kaya told Turkish media, "We ask European countries, especially the Netherlands, to immediately return to democratic values they say they defend - the freedom of expression, action and assembly. They suspended all of these." She tweeted, "The whole world must take action against this fascist practice! Such a treatment against a woman minister cannot be accepted." Dutch politician Geert Wilders told Al-Jazeera on Saturday, said the moves by Erdogan and his ministers to campaign in foreign countries were "totally unacceptable." "It is uncommon and unwanted that his minister would go and campaign in Holland for a referendum to change the constitution there to make him [Erdogan] more of a dictator," Wilders said. "He should not be allowed here at all. "And after him calling Dutch people Nazis and things like that, the Turkish ambassador should be extradited from the Netherlands immediately and retract our ambassador from Ankara today."